Adjustable Tritoon Upgrade - Adds Width & Height Adjustable Center Bunk. For use when center toon is larger or slightly lower than outer toons. 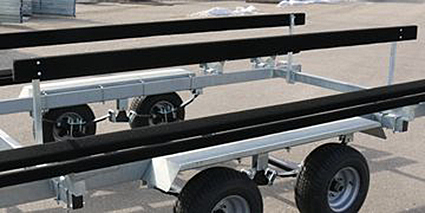 Genesis Float On Pontoon trailers feature an all welded hot dipped steel galvanized frame, single or tandem axles, submersible lights, and marine carpeted bunks. 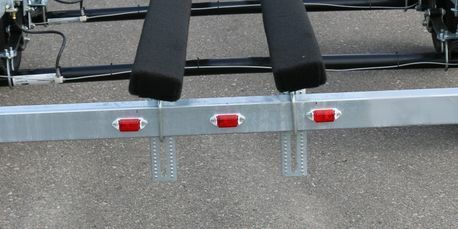 Pontoon trailers are available for pontoon boat lengths from 10' to 28'. Electric and hydraulic brake options available for one or both axles. The tritoon option adds a center bunk making it a tritoon trailer for use with tritoon boats. Get your pontoon or tritoon boat in and out of the water easily with a Genesis Pontoon trailer. Built tough for years of reliable service. To upgrade to a tritoon trailer, select the tritoon upgrade in the options below. This upgrade requires that all 3 pontoons be round, of equal diameter(27" max. dia. ), all on the same level, and all the same length. If your tritoon boat has a slightly lower center pontoon, you may order the optional adjustable tritoon which allows the center bunk to be lowered by 2"
Pontoon trailers cannot be shipped and must be picked up in Holland Michigan. Some states require brakes on one or both axles (on tandem axle models). Please check your state's requirements before ordering. See brake options in options chart below. Pontoon trailers are ordered online or by phone and then picked up in Holland Michigan when ready (normally 5 to 10 business days). Pick up times are weekdays between 9 AM and 4 PM. Due to regulatory restrictions, we cannot sell trailers to Illinois residents. Ordered a PT20T and couldnt be happier. very well built and towed great. The people at the pickup facility were also friendly and helpfull. Well built and galvanized. Tows well. Picked up in Holland and no problem.